Most of the private companies in the U.S. are formed as pass-through entities. This means that the income received goes to the owners, and this income is taxed as personal income tax. Depending on where you live, these income tax rates can get as high as over 50 percent. With that said, these high taxes cause some business owners to do all that they can to reduce the amount they need to pay to the IRS. For some, that means using their companies as a cover for their personal and family expenses. Any aggressive tax method used to avoid paying taxes, or even lowering taxes, is referred to as tax evasion. Most business owners know exactly what the repercussions are, but unfortunately, it usually isn’t just the owner who gets punished for this sort of behavior. Private company owners who have committed tax evasion are going to get into some trouble, but they aren’t the only ones who get punished. CFOs, controllers, chief accounting officers, treasurers, and anyone who deals with the financial aspects of a company can also get into trouble. An owner used his children’s tuition as a business expense. A man wrote off extremely expensive work boots (over $10,000) each year. While these boots were purchased every year, they were made from exotic materials, including boa constrictor and ostrich skin and didn’t use the boots to work. An owner’s son, who did not work for the company, somehow drew a salary of $100,000. Remodeling or repairs for a personal residence, such as a home or vacation home. Handling legal expenses, including personal litigation, estate planning, or divorce. Pursuing personal hobbies, such as collecting boats. Selling inventory or scrap and sending the money straight to the owner’s personal account. Paying child support or alimony from the company and using them as company expenses. Keep in mind that there is a big difference between tax evasion and tax avoidance. All business owners have the right to avoid taxes. After all, that’s what many financial and tax advisors are for. If you are someone who handles the financial records of a company, and you aren’t sure if something is tax avoidance (legal) or tax evasion (illegal), then there are a few steps you can take. Tax avoidance is when a business uses the laws set in place to reduce the amount of taxes they will need to pay within the limits of the law. Tax evasion is entirely different; it is intentional avoidance of taxes by using illegal means of hiding transactions. Tax evaders will purposefully disguise or lie about their business’ financial state in order to reduce the taxes they need to pay. For example, if a business owner has his basement remodeled in his home, which is not used at all for business, he may try to spin it as a business expense. He may tell his accounting staff to document this cost as a company repair and maintenance fee instead of treating this remodel as a loan or distribution to the owner. This lowers the company’s taxable income, skews his personal tax return information, and as a result, means he has committed tax evasion. Employees face a great risk when they handle financial discussions. First, they all should seek written permission from officers and owners before speaking with tax advisors. This is because private companies can actually sue employees who share information without permission from the owner. All financial information is considered property of the business, not the employees. Employees who share confidential data without permission can be charged with theft or even breach of fiduciary duty. If an employee is sued in this situation, they may win the lawsuit—but usually not before paying tens or even hundreds of thousands of dollars in legal fees. 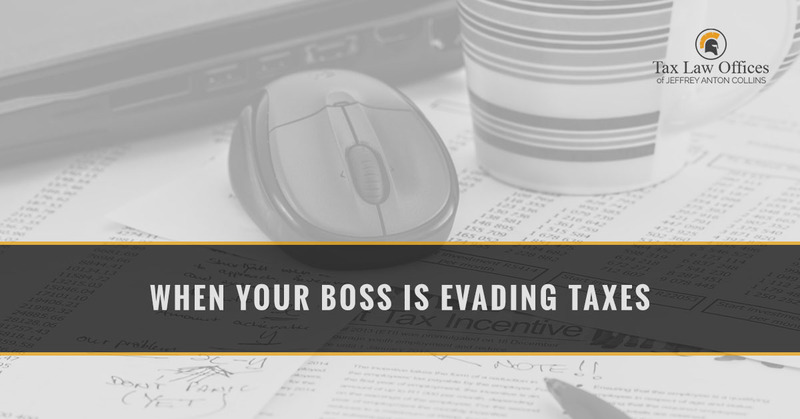 If you suspect that your employer is evading taxes, you need to seek advice from an attorney, such as the ones at Tax Law Offices. Share your entire story, but do not take any physical documents or evidence from your employer. Your attorney will know what needs to be looked into further, and they will be much more likely to protect you from being sued by your employer for coming forward. If you do seek help from an attorney, it is in your best interests to consider resigning from the company. This is because the tax evasion issue may not go away in the foreseeable future. Still, we recommend paying attention to the finances of your business. The higher the tax burden, the more tempting it is for employers to consider ways to lower their payments. If you have an issue with your employer and possible tax evasion, reach out to the professionals at Tax Law Offices today. We look forward to working with you and providing legal counsel.